Augusta Coin Exchange - Coin & Coin Collection Appraisal in Augusta GA, Aiken SC, North Augusta SC, Greenwood SC, Barnwell SC, Wrens GA, Thomson GA, Harlem GA, Grovetown GA and Evans GA.
Augusta Coin Exchange can help you learn the current value of your U.S. gold coins, coin collection, paper bills and other currency with their appraisal services. 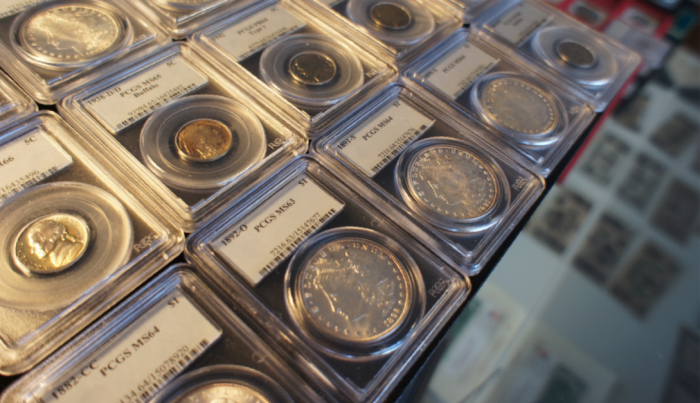 Whether you’re interested in selling your coins/collection or simply wish to know their worth, Augusta Coin Exchange specializes in coin appraisal in Augusta GA, Aiken SC, North Augusta SC, Greenwood SC, Barnwell SC, Wrens GA, Thomson GA, Harlem GA, Grovetown GA and Evans GA. With more than 25 years of experience in grading and trading rare coins John Rusinko, is an expert in coin appraisal. He’s happy to provide you with a free coin appraisal for up to 25 items and charges a fee for written coin or collection appraisals. If you’re interested in selling your coins, Senior Coins is prepared to make you a fair offer.